Through the Looking-Glass, and What Alice Found There (1871) is a novel by Lewis Carroll, the sequel to Alice's Adventures in Wonderland (1865). Set six months later than the earlier book, Alice again enters a fantastical world, this time by climbing through a mirror into the world that she can see beyond it. The White Knight is a fictional character in Through the Looking-Glass. He represents the chess piece of the same name. The White Knight saves Alice from his opponent, the Red Knight. He repeatedly falls off his horse and lands on his head, and tells Alice of his inventions, which consists of things such as a pudding with ingredients like blotting paper, an upside down container, and anklets to guard his horse against shark bites. 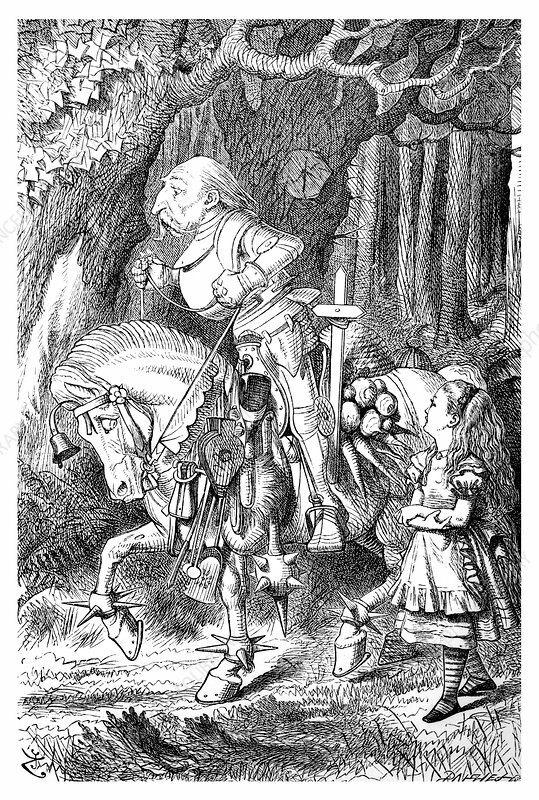 John Tenniel (February 28, 1820, February 25, 1914) was an English illustrator, graphic humourist, and political cartoonist prominent in the second half of the 19th century.